BESTEK patio umbrella base stand tempered across designed, ideal for patio umbrellas or other outdoor umbrellas. Rust free with strong support, keep umbrella stable enough against winds. 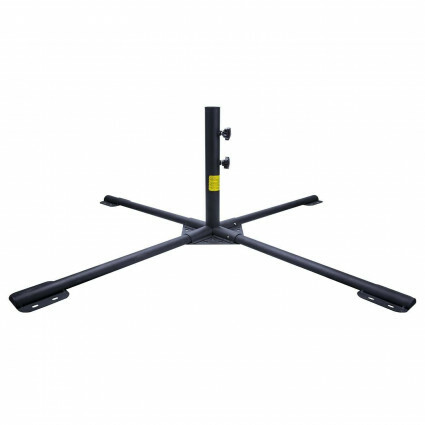 The umbrella base comes with ground prongs and exclusive screws and two pole thumb screws for extra support and security, keep umbrella stable and safe. Made of high quality rust-free tempered iron with powder coating, ensure longer lifespan even in a tough condition. Umbrella base is detachable, easy to install and store. Compatible with any 1.5” umbrella poles; ideal for home and commercial use.